Working with fragrant fresh greens can be uplifting and therapeutic. 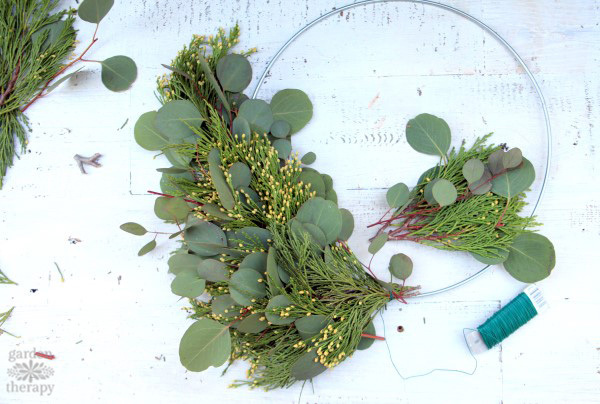 Each year when I make my holiday wreath I’m struck by how fresh and pleasing the greens smell. The bright, woodsy, clean fragrance brings me joy in the winter months when there are no fresh flowers to cut from the garden and keep inside. 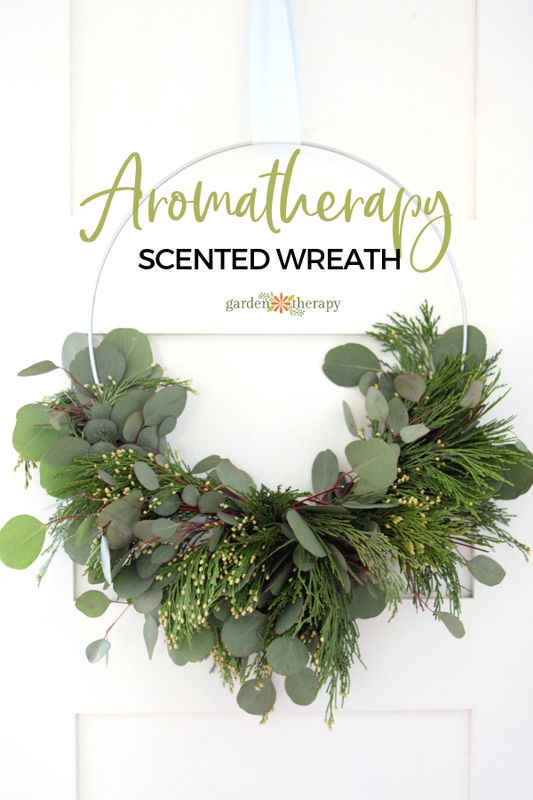 This scented wreath made of incense cedar and eucalyptus is not only gorgeous, but it is also very fragrant. It is hung on the powder room door by the entrance of my home, so that I can enjoy the fresh scent the moment I walk in the house. 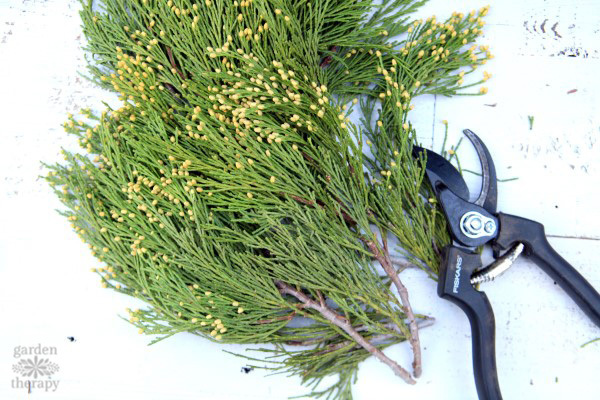 Incense cedar adapts well to both drought and humidity, making it a good choice to grow in many different climates. It has sprays of flat, bright green foliage that are very aromatic with a strong woodsy scent. Cedar is often used in aromatherapy—in fact, it was probably the very first scent that was made into an essential oil. In aromatherapy, cedar is thought to increase focus and ease anxiety, reduce inflammation and congestion, and help with insomnia. It is also a natural deodorizer. Eucalyptus grows well in zones 8-10, and in cooler areas you can grow it in a container and bring it indoors for the season. You can also easily find eucalyptus branches at many garden centers and florists if you don’t have your own plant but want to use some in a project like this one. It has gray-green leaves and reddish wood that contrasts nicely with the foliage, and of course it is most known for its strong aroma. Eucalyptus smells minty and woody with notes of citrus and honey. Eucalyptus is very popular in aromatherapy. It is often used to treat respiratory problems, coughs, and congestion (try these shower steamers for a cold remedy that uses eucalyptus), but it is also purported to increase energy, decrease stress and anxiety, and its deodorizing and antibacterial properties make it an effective natural air-freshener. 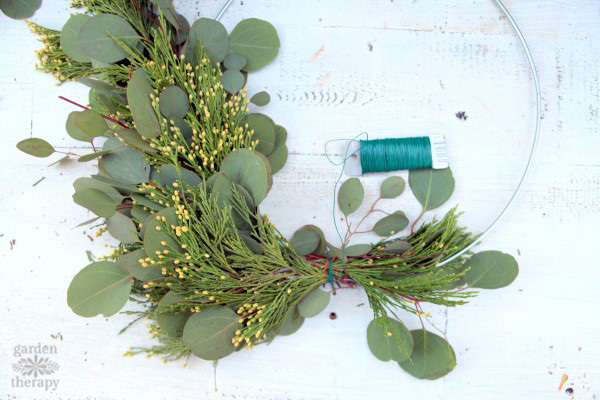 Start the wreath by cutting branches of cedar and eucalyptus into 5” long stems. 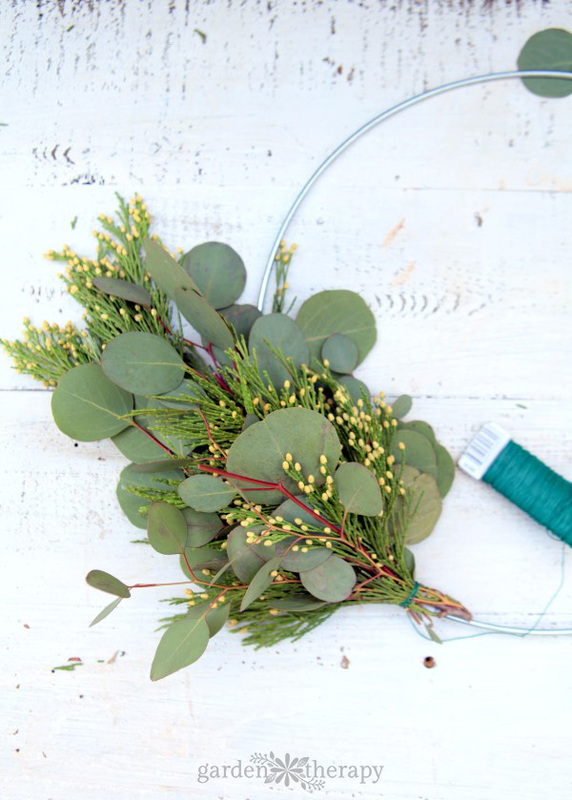 Gather a few of each into a small bundle and wrap the paddle wire around the stems a few times. Use the paddle wire to secure the bundle to the wire hoop by wrapping it tightly around both the bundle and the hoop. Leave the end of the paddle wire intact as it will be used on each bundle to secure it to the wire hoop. Gather a second bundle and layer it over the first one, covering the paddle wire. Wind the paddle wire around the stems of the second bundle and the wire hoop. 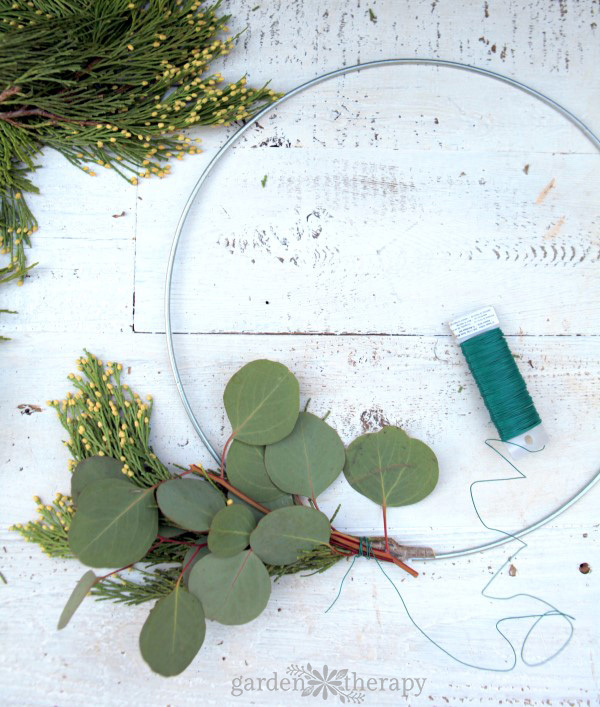 Continue adding bundles around the wire hoop until you have covered ¼ of the hoop. 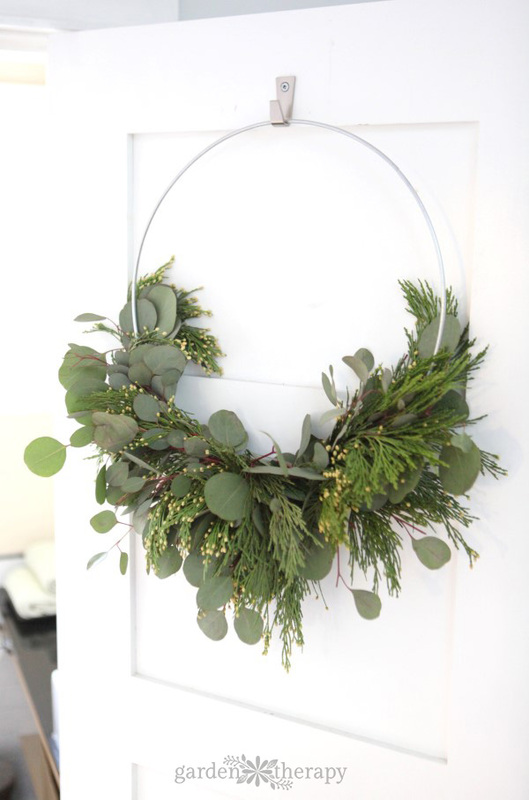 Gather a fairly full bundle to use at the end of the greenery on the wreath. Position this bundle in the opposite direction of the previous ones, and secure the stems to the hoop. Cut the wire and secure it in place behind the wreath. Gather a small 3” bundle and use a section of wire to hold it together, leaving the ends 2” long. 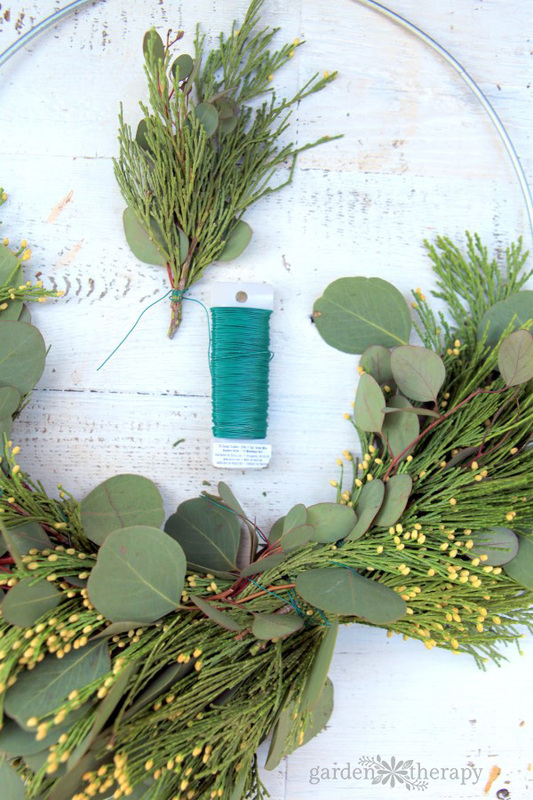 Push the wire and stems into the stems that are attached to the wreath to camouflage the wire. 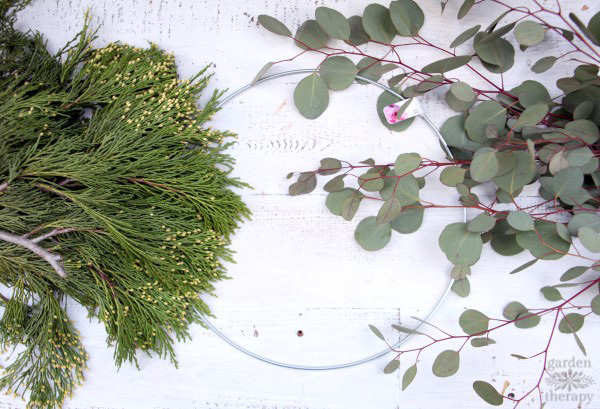 Secure the paddle wire at the back of the wreath. 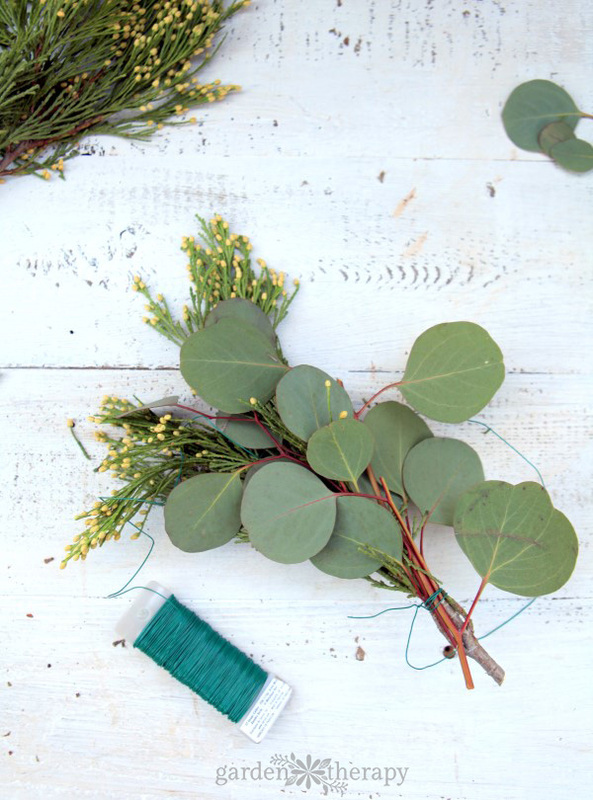 Tuck in a few more pieces of evergreen to cover up any visible paddle wire and fill out spots that are uneven. 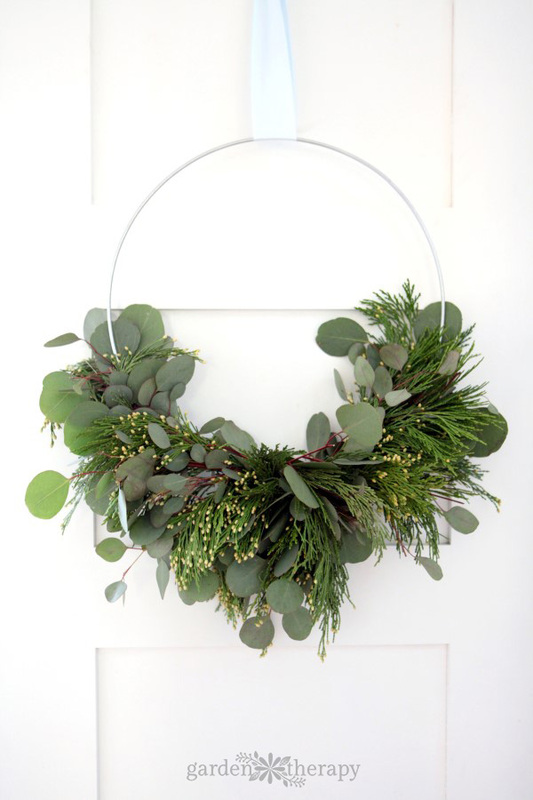 Hang the wreath indoors in a high-traffic area where it can be enjoyed. This wreath should last 3-5 weeks indoors. As the greens dry, use needle-nose pliers to tighten up the paddle wire. When you are finished enjoying the wreath, unwrap the paddle wire and wind it back onto the paddle to be used again next time. The greens can go in the compost. This looks beautiful and I’m sure it smells amazing! That is beautiful! We have a lot of incense cedar here and this seems lovely. I’ll give it a try next weekend. I absolutely love the wreath work that you do! I hope to try this one day, so thanks for the instruction.